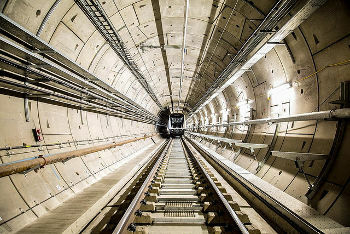 Transport for London and Crossrail Ltd have hailed ‘a major milestone’ after the first Elizabeth Line train was tested under its own power in the new tunnels through London. The new train, built by Bombardier engineers in Derby, entered the new tunnels at Plumstead portal and travelled at low speed under the Thames heading for Connaught Tunnel before returning to Abbey Wood station. The first of hundreds of test runs that will take place throughout the year came as Crossrail construction reaches its final stages. Testing of the railway and signalling infrastructure will now begin to ensure services are safe and reliable for the opening in 10 months' time. Crossrail chief executive Andrew Wolstenholme said: 'The start of infrastructure testing is a major milestone moment. It's testament to the men and women who have, and continue to, work tirelessly on the project that we are now welcoming the first Elizabeth line train that's powered by the new overhead lines, into the tunnels. The train was previously hauled through the tunnel to Abbey Wood in October 2017 using a locomotive. Earlier this month, Crossrail Limited successfully activated the 25kV overhead lines in a section of the tunnels beneath the streets of London, making this week’s test possible. A significant amount of work continues to complete all stations on the route as well as bringing together the interfaces between track, power, signalling and trains. Direct services will operate from Paddington to Shenfield and Paddington to Abbey Wood. Services from Paddington to Heathrow will continue to start and terminate in the main line station. The line will fully open, with services running from Reading and Heathrow in the west through the central tunnels to Shenfield and Abbey Wood in the east.